Old Phone Boxes, New Defibrillators. 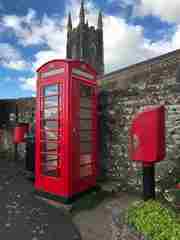 Reviving Phone Boxes Produces a Shock! Parkham Parish had 3 phone boxes which were decommissioned by BT as working appliances in July 2016. They were offered to Parkham Parish Council for the vast sum of £1 each. The Council decided that two out of the three would make useful additions to the community assets of the Parish and bought one by St James’ Church, Parkham and one opposte the “Coach and Horses” in Horns Cross. Both boxes are of the famous K6 design of 1936 and known as “Jubilees”, as this was the year of the jubilee of King George V. The Council set about restoring these old boxes to their former glory – a lengthy task undertaken by Mark Thorn of MST Property Maintenance. 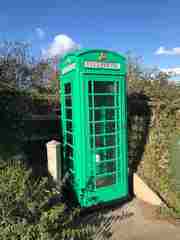 The villages within Parkham Parish, whilst small, are certainly individual and so Horns Cross opted to paint their phone box a shade of emerald green, whilst Parkham opted for the more traditional GPO Telephone Box red. One further important change was made. The “Telephone” glass panes at the top of the phone boxes were replaced by “Defibrillator”, for each box houses a fully accessible defibrillator for emergency use. Many villagers have been trained in its use and in emergency resuscitation techniques and they maintain a regular check on the equipment to ensure it is constantly available; in this way Parkham Parish has improved its resilience as a rural community at some distance from emergency medi. These telephone boxes have been a traditional part of the Parish for a good many years and we are very pleased to have extended their working lives in the service of the community as a facility to store our defibrillators safely. We are also anticipating additional uses for these boxes as community libraries and local information centres and in many other ways yet to be investigated.